In my book, there is nothing better than a one-pot dinner. Meals made in one pot have two major advantages. The first is that the ingredients and spices get to hang out together throughout the cooking time, leading to a delicious blend of flavors. The second is that there is only one pot to wash up, which is always a bonus. 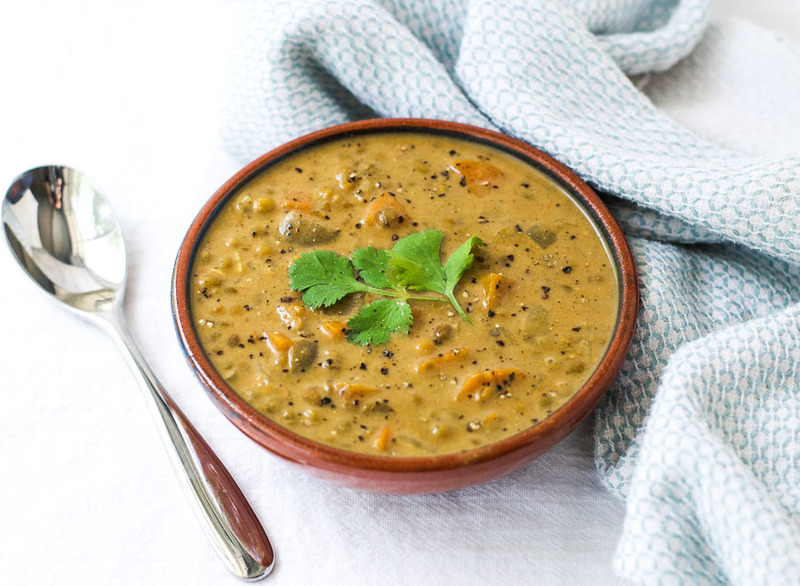 And what better example of one-pot cooking than this coconut curry lentil soup. Lentils are an incredibly affordable source of protein. 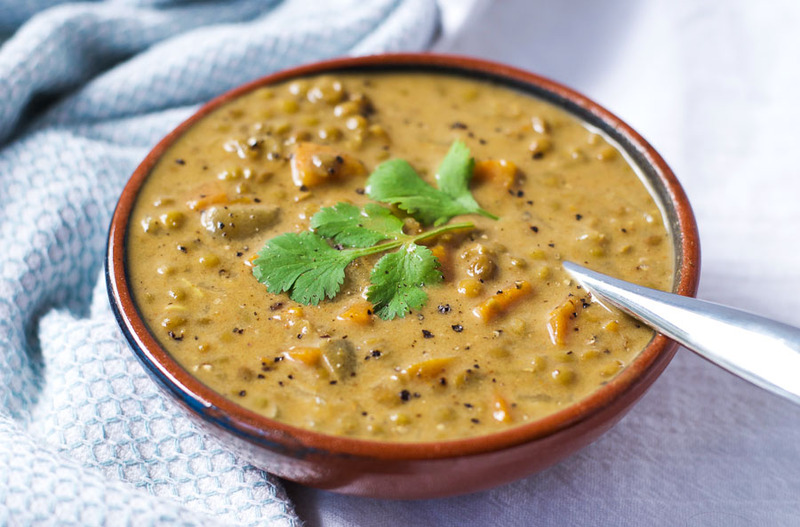 One cup of cooked lentils contains 18 grams of protein. To put that into perspective, a 3 ounce steak contains around 22 grams protein. 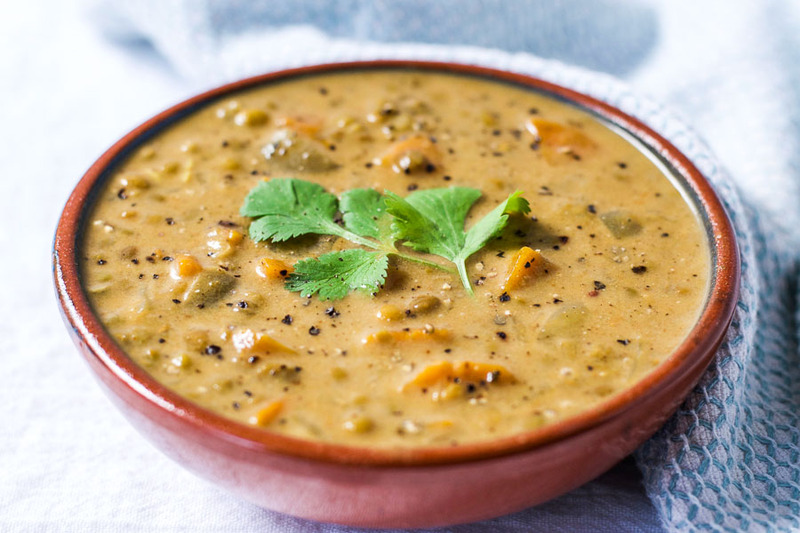 In addition to the protein, lentils are packed with fiber, iron, and folate. They are also very low in fat and they don’t need to be soaked before cooking. They lend themselves perfectly to the aromatic curry spices and the creamy coconut milk in this recipe. I like to use small whole green lentils, but you could use red lentils if that is what you prefer (or what you have in the cupboard). And if you want to lower the fat content, you could use light coconut milk instead of regular. Heat the oil in a large pan over a medium-low heat. Add the onions and carrots, cover, and cook gently for 5 minutes. Add the garlic and ginger, cover, and cook for a further 3 minutes. Add the lentils, turmeric, curry powder, coriander, garam masala, cumin, chili flakes, salt, and tomato paste. Cook for 2 minutes, stirring well to combine. Add the vegetable broth and water, bring to a boil, cover, and turn down the heat. Simmer for 30-40 minutes, or until the lentils are soft. Add the coconut milk and chopped cilantro. Muy bueno el curry de lentejas. Made this tonight with some garlic and cilantro baked naan. So delicious and warming!! A keeper! Thank you for your comment Justine. I’m so glad you enjoyed it 🙂 I really appreciate you coming back to give some feedback. Thank you for your comment. I’m so glad to hear that your toddler loves it too. It’s always satisfying when you can get your child to eat something so healthy, isn’t it? Thanks for the feedback. I just made this and it’s wonderful. Our 7 month old baby loved it too (left out the chili flakes for his and blended his). I also try not to use anything canned so as I learned in Morocco, I just took two tomatoes and shredded them. Really a wonderful recipe!!! Thank you. Simply delicious and easy for my crockpot! 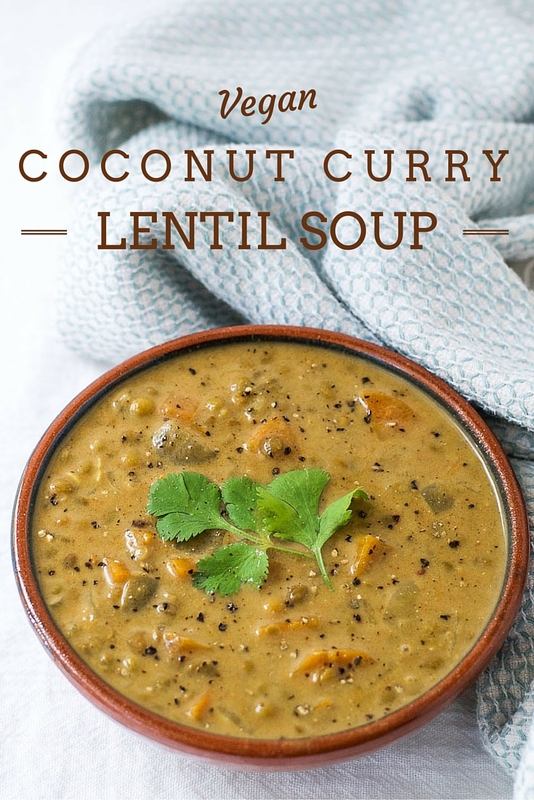 This soup was delicious but had way too many lentils for the amount of liquid. I used double the amount of liquid and it was still not enough for 2 cups of lentils. Also 40 mins cooking time was not enough to fully cook the lentils. They were still quite chewy. I would use 1 cup of lentil and still probably add more liquid (water or broth) and cook for at least an hour.